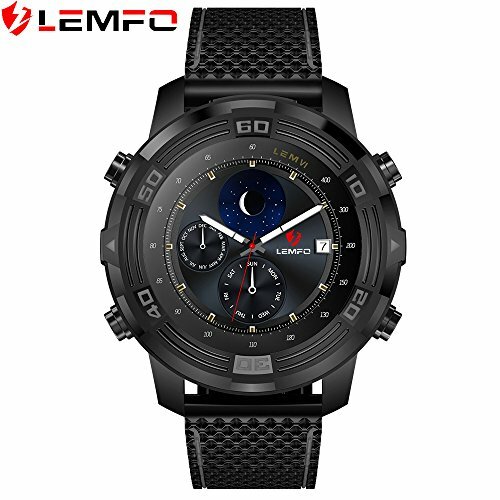 1.Scan QR code Download "LEMFO Watch" on your phone or download the App from google play or apple store. 2.Turn on Bluetooth on your phone. 3.Turn on Bluetooth on your watch. Then from the watch Bluetooth interface, you can see your phone name on it. Click the phone name and pair with your phone. Click Ok to confirm. 4.Open APP"Lemfo watch "on your phone. Scan device and find your watch name or serial number. Finally, connect to your phone and syncs data from your watch. You can also set SNS notifications of your watch through the app. 5. Finally, if you wanna make an independent call, In the state of shutdown,simply pull out the sim card slot and insert your sim card. IP67 Professional Waterproof：Suitable for swimming, white water rafting, non-snorkeling water related work, and fishing. Replaceable Silicone Strap：Easy to disassemble the strap, replace the style. A variety of changes. Android 5.1：Built in 1GB + 16GB memory, take it as a wrist smartphone. You can download thousands of Android apps from Google play store. Motion Trajectory：Check real-time or historical walking trajectory, so you can find each other fast. If you have any questions about this product by LEMFO LEM6, contact us by completing and submitting the form below. If you are looking for a specif part number, please include it with your message.